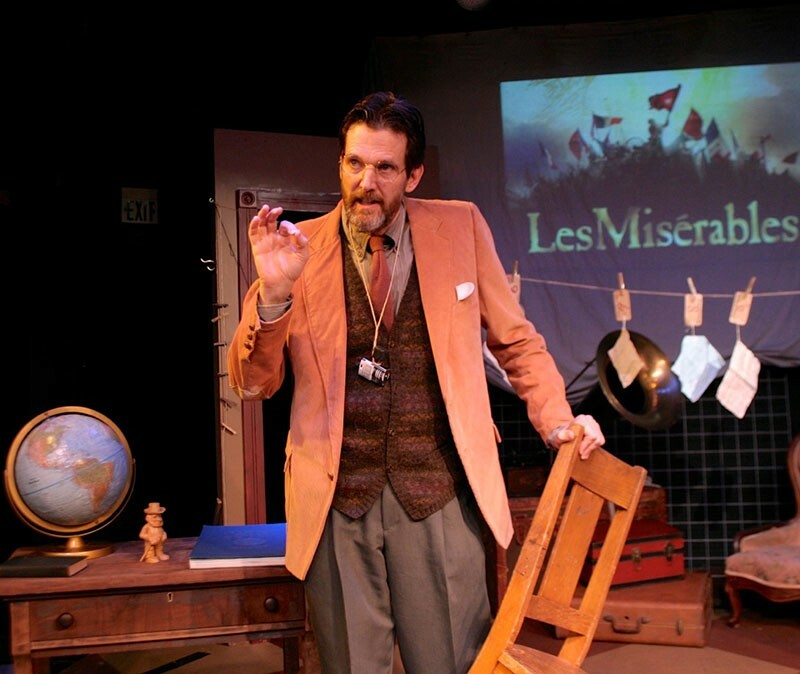 CHECKED OUT John Shillington is captivating in Main Stage West's new production. 'If you have a book that is 113 years overdue," sighs the Librarian, holding up the ancient book that was secretly left in the overnight return slot, "You go to the counter!" In Glen Berger's metaphysical one-person mystery Underneath the Lintel, that 113-year-old book soon launches the Librarian on a globe-hopping journey of discovery. Initially, the Librarian (played with baffled, escalating wonder and rising emotion by John Shillington) hopes to collect a whopping fine, sending a letter to the only address available—in China. When the Librarian discovers that the recipient, known only as A., also left a decrepit London laundry ticket (for a pair of trousers) in the returned book, he sets off for England in hopes of tracking down more details about the presumed-dead Mr. A. Related as a rambling lecture titled "An Impressive Presentation of Lovely Evidences," the Librarian's shaggy-doggish story covers as much philosophical ground as the Librarian logs miles. Is A. some sort of a time traveler? A ghost? Or just a very old guy who leaves a lot of stuff behind? The truth—or at least the truth that the Librarian finally settles upon—is nothing short of earth-shaking, and calls into question the randomness of fate, the nature of God and the defiant resilience of the human spirit. Directed by John Craven, the entire story is related from the stage of a second-rate auditorium. It's all the Librarian can afford. As he produces one piece of evidence after another—each with a little numbered tag on a string—they are hung from a clothesline stretched across the stage. It's one of many nice touches Craven brings to the proceedings, though the final half of the show—when the energy of the story really begins to pick up—has a few too many distracting musical cues. Did the Librarian really give someone a list of songs to play at specific moments in his lecture? Not likely. Such moments break the magic spell of the play rather than add to them. Thankfully, there is so much magic and bittersweet beauty in the script, and Shillington's performance—a little rushed at first, but settling down later when he begins to allow himself to occasionally pause and react to the story he's relating—is northing short of captivating. Underneath the Lintel, like the mysterious Mr. A—and the Librarian who discovers his secret—is much bigger, and much more important, than it first appears.